The Broadcountry Cinema 3 in Magee sits just off of Highway 49. 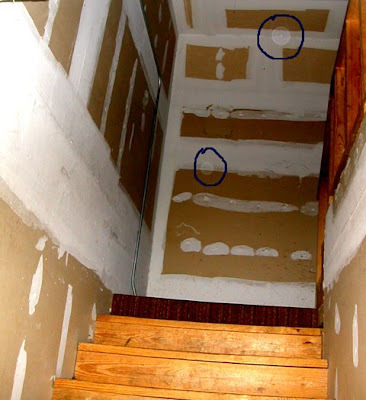 By "Unexplained" standards, this 18-year-old building is practically brand new. Dozens of reports of paranormal phenomenon have caught the attention of "Unexplained" investigators and we decided to check it out for ourselves. These strange happenings started when the building was still under construction. Owner Butch McCall was showing a friend around. "He gets this funny sound in his voice and he's like, 'Man, this place is haunted.' I'm like, 'Well, it can't be haunted! It's not built yet!'" Nearly a decade later, McCall and his employees had their first paranormal encounter with the woman they call the Lady in Red. Oddly enough, the Lady in Red is associated with the red room, one of three auditoriums. Nobody is quite sure who she is or where she's come. However, several people have seen her. McCall describes her as having long black-brown hair and wearing a long, red dress - clearly a period dress. "She always seems to be heading in the direction of what we refer to as the red auditorium or the middle-sized auditorium." Projectionist Chuck McLain says, "I noticed someone going in the red auditorium. I thought to myself, 'Well we're not showing anything in there.' I was going to stop the person, and I looked up and they were gone." McCall has also spotted her in the projection room, but a few encounters have taken place outside the red room and the projection room. 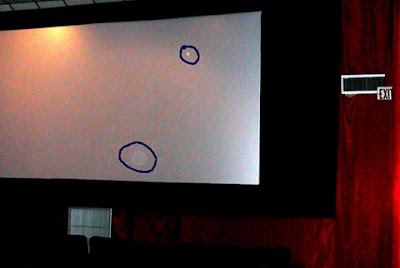 One such incident occurred in the theater's lobby. Theater worker Florence Ware says, "I had some concessions to put up. So, I was at this little door down here and this cup hit the floor. The first thing I thought about was everybody talking about the ghost!" McLain recalls, "I heard someone say 'Hey!' Again, there was nobody in here but me." An interesting thing to point out is the employees don't mention their ghost much. Yet they continue to get independent confirmation from workers about the Lady in Red. 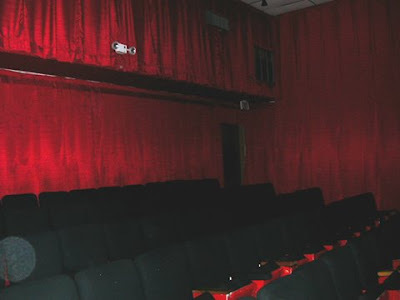 McCall says visitors with no prior knowledge of the cinema's ghost ask him if anyone has ever informed him or if he knows that his theater is haunted. "So, then we open up. It's like, welcome to the club. You've seen her!" So, "Unexplained" investigators decided to look for evidence of the Lady in Red. The focus was on the areas with the most sightings: the red room and the projection room. We started by taking digital pictures, looking for orbs, which ghost hunters believe are visual proof of spirits. 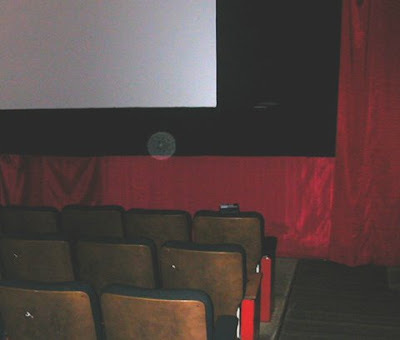 These pictures contain some the largest orbs ever captured by "Unexplained" investigators. 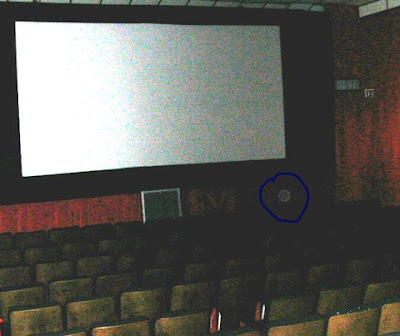 We know it's not debris on the lens or other anomalies, because these large orbs are in different locations in these pictures.Also, used in our investigation was a Tri-field meter, also called a ghost detector. This device measures the electromagnetic frequency several feet around it. A steady, constant tone indicates no change in the field. Yet, in the blue theater, the meter's tone fluctuates while the room was empty. Although, this might not be definitive proof of a ghostly presence, the visual and audio evidence is compelling. The workers at this cinema, however, don't need this evidence. They know the Lady in Red is here, and she's probably sticking around. Ware says, "I had never really believed in ghosts till all this. There's something." McCall thinks, "She just likes sashaying around here."